Laminate bent mullions over ground glass doors give this contemporary piece a traditional feel. Rope lighting set into top of crown gives off warm accent light that glows above the unit. Traditional canvas backed tambour doors. Shelf will accommodate DVD player and VCR and can be adjusted above or below TV. Piano hinged doors have inset rare earth magnets to hold doors open during viewing and shut when not in use. 3-way grounded outlet box. Vented back panel. This cabinet of many curves has five large drawers in dresser and an upper cabinet with traditional canvas backed tambour doors will hold blankets or can accommodate a 20" TV. This nine drawer dresser is made in 3 pieces. Extra deep center cabinet with pocket door system easily accommodates 36" television. Separate compartments hold over 100 compact disks. 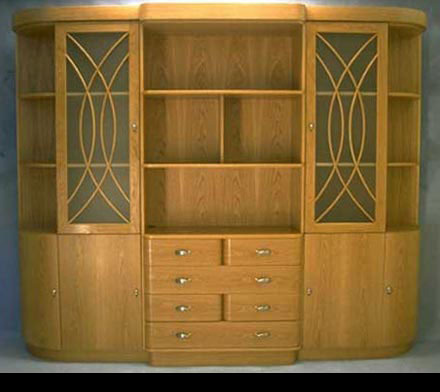 End sections have laminate bent doors and drawers that could be divided to store CD's or DVD's. 6 grounded outlets in center cabinet and vented back panels.